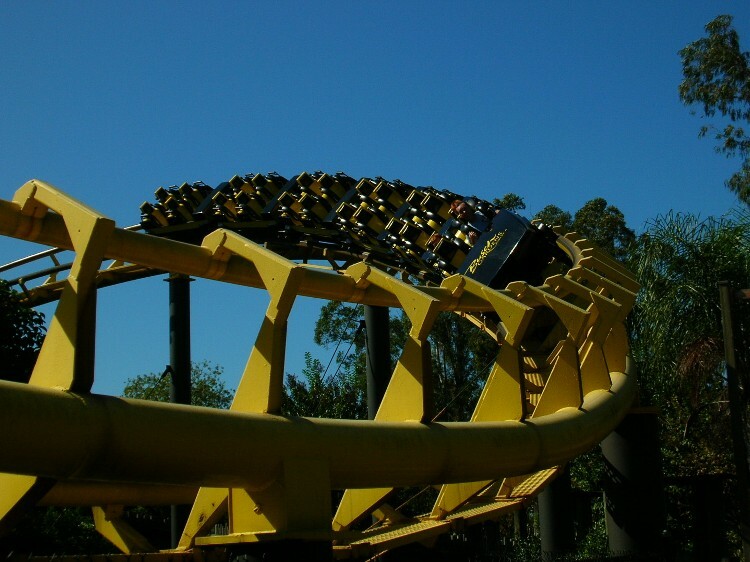 Well, since I had to work today at the park, I took one last spin on Python, which I believe is the oldest Arrow corkscrew still in operation. 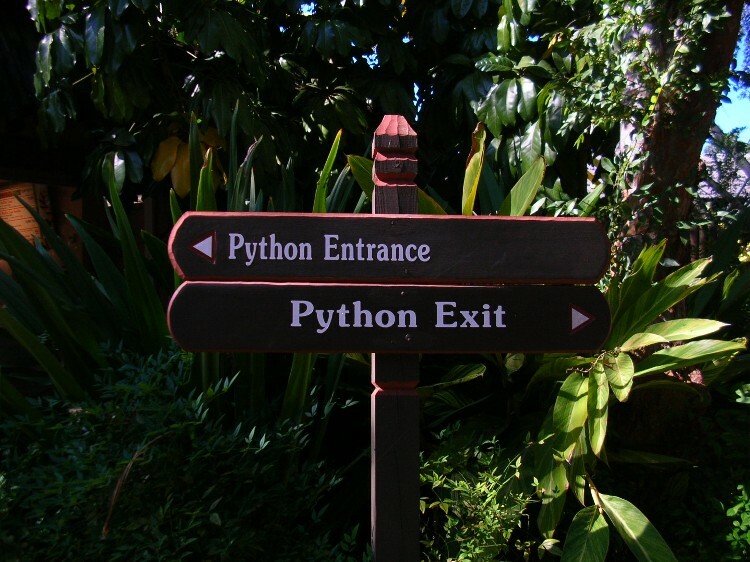 I knew that Knott's opened theirs in 1975 and I believe BGT's Python was 1976. 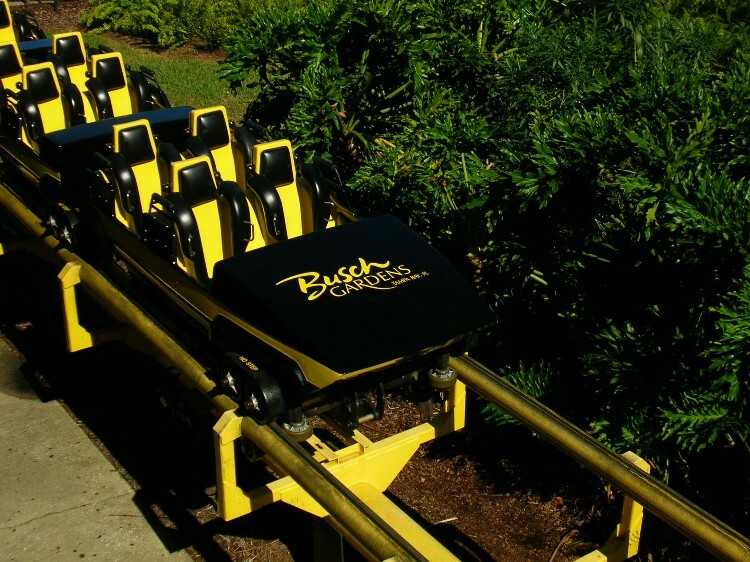 I had ridden this model several times before, mostly at Geauga Lake in the 80's and once at Myrtle Beach. Anyway, there was NO ONE is the park today! I got to ride it first and solo! Yep, just me, the car, and a pain in my neck that will last awhile! Nothing much else to report. It ran rough, it rattled, it looped twice and made it back to the station. 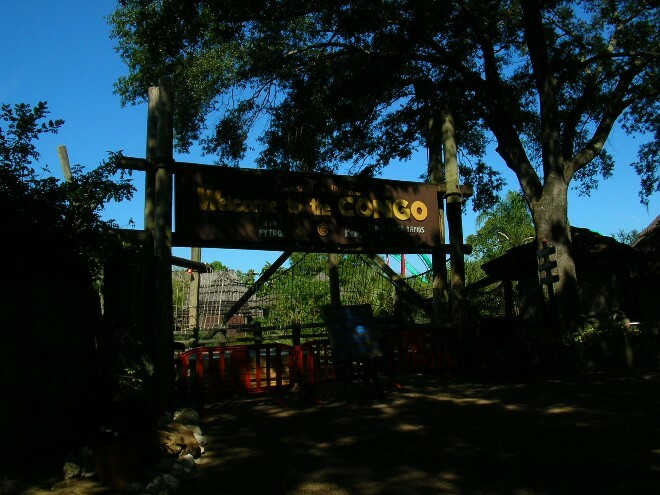 I will miss the dense foilage that has grown up around this coaster in the last 30 years, but the whole Congo area is in despreate need of an extreme makeover! 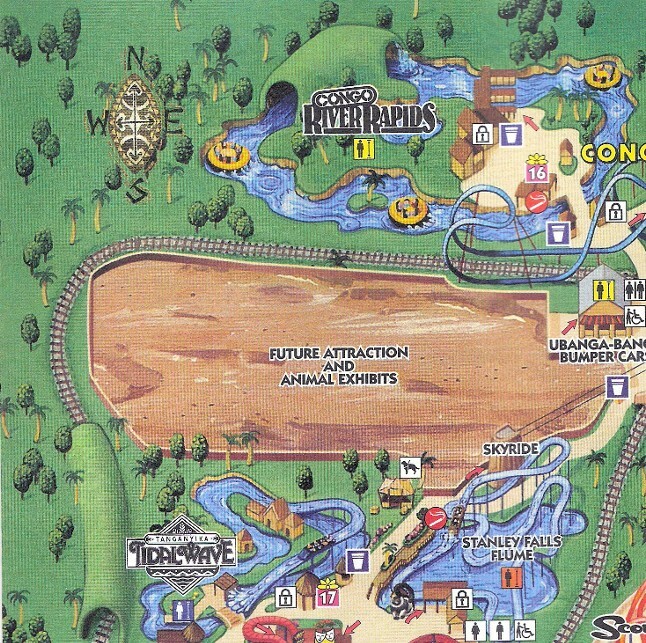 In my opinion, a nice observation tower or drop ride would fit in very well there. But whatever BGT does, I am sure it will be done tastefully and with class. So long Python....now on to the pics! UPDATE: More pics from Wednesday showing the area closed. UPDATE 2! 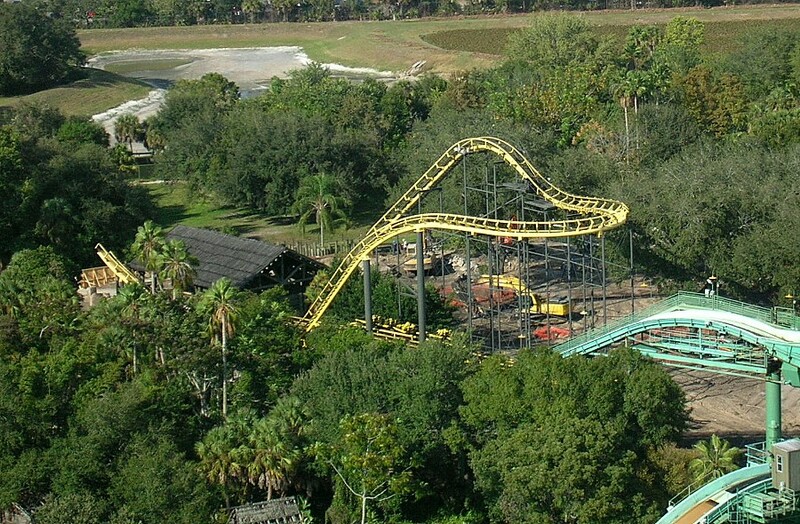 I took a pic yesterday from Sheikra that shows part of the Python being dismantled. The sign....wonder if this will show up on Ebay? Some people go both ways! See...I told you the area was overgrown! Pretty cars....which apparently are headed to BGW for Loch Ness Monster. Hmm...aren't these cars OLDER than the Loch Ness ones? But they do look nice! My attempt at taking a decent pic. Unfortunately, the other ones were too dark. Damn you shady trees!! And damn you bulging neck veins! 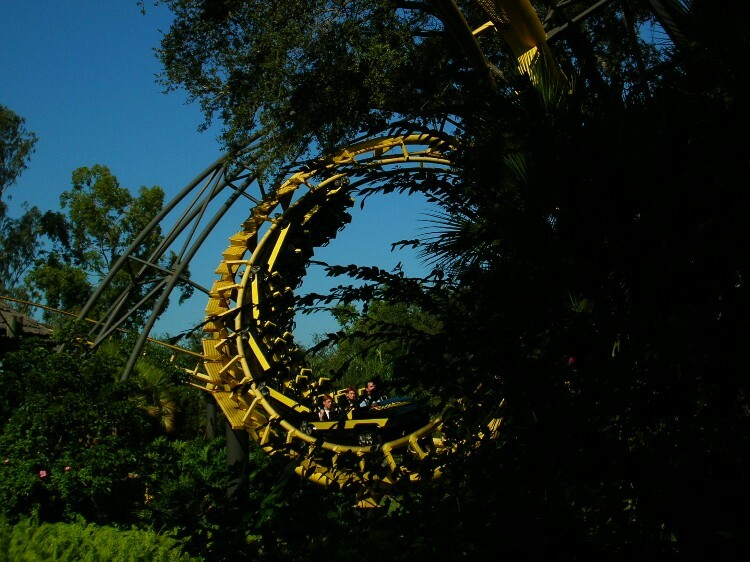 I remember seeing this same shot back in the 70's in a Sunday magazine advertising Busch Gardens The Dark Continent! Yeah, we need some hedge trimmers STAT! Oh yeah, I had to get my Sheikra fix. Notice the seagull wanted to make it into one of these photo TR's! One last pic. Notice the splash behind me! 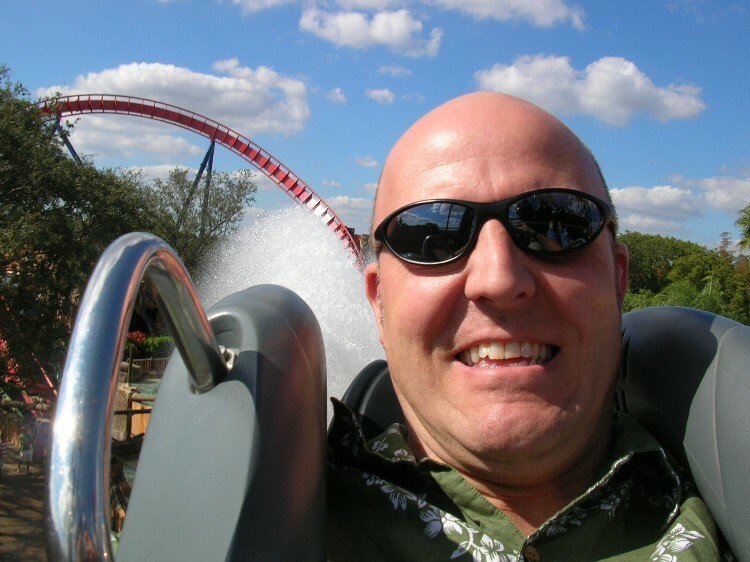 Oh, and you must have double chins to ride Sheikra! 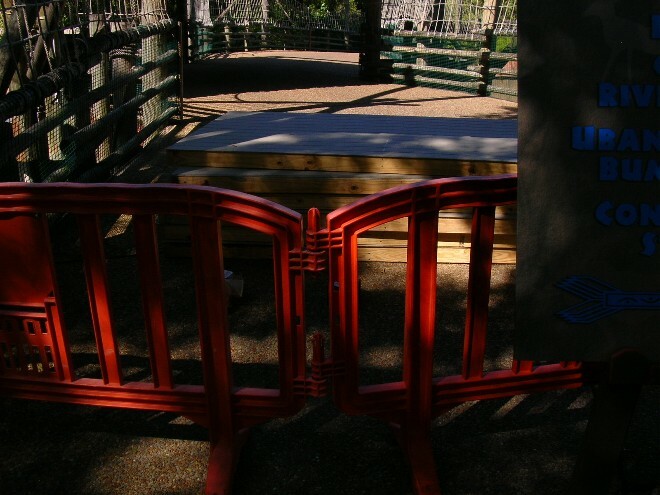 Sorry folks...the moose out front should have told you! 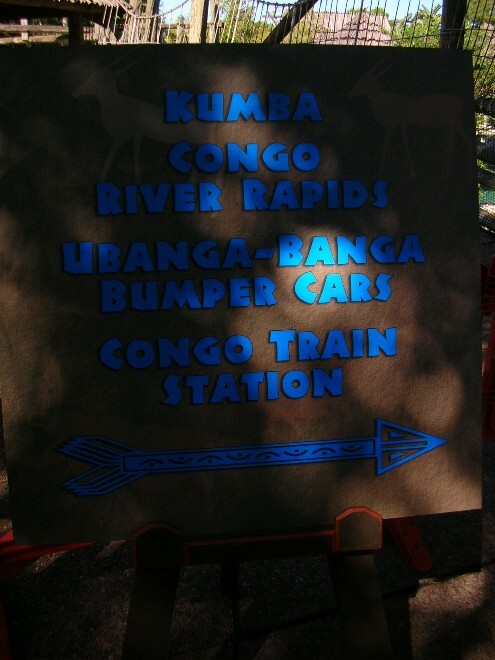 A sign at the bridge tells you where to go for more fun since the Congo is closed. That's the way it looks for now. 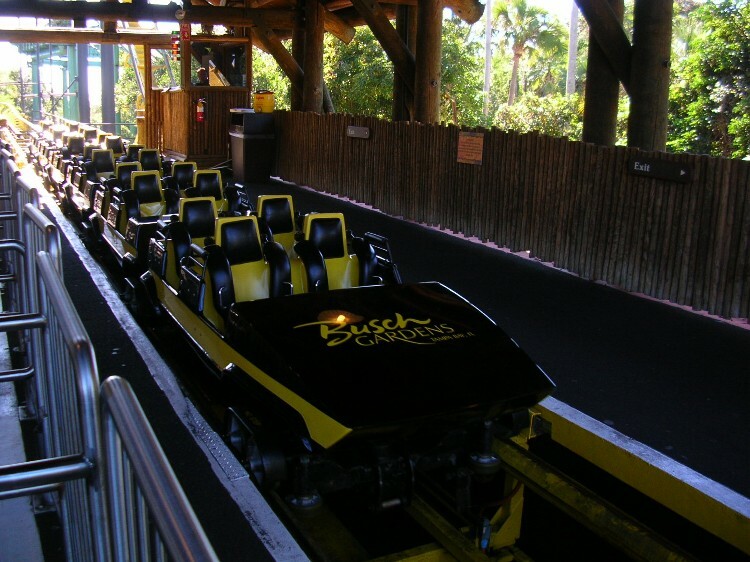 The Python as seen from Sheikra. The corkscrews appear to be gone, and the lift hill is missing from the station to about 20 feet up. This was the best pic I could get since the whole area is walled off. Crap... now I'll never get to ride. Anyways, I'm glad that I got the python credit in this spring - first inversion baby, yeah! Great photos - nice seagull, too! 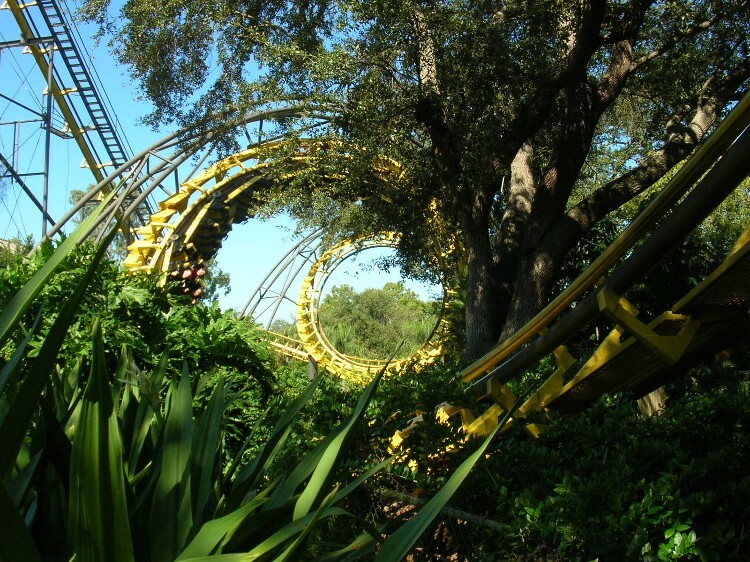 Well, since I had to work today at the park, I took one last spin on Python, which I believe is the oldest Arrow corkscrew still in operation. 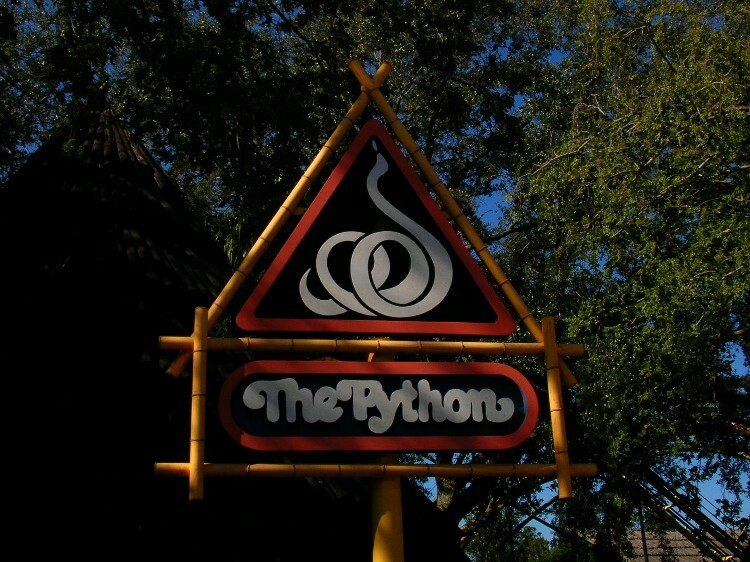 I knew that Knott's opened theirs in 1975 and I believe BGT's Python was 1976. Nope. Knotts was relocated to Silverwood, so the original is still around. 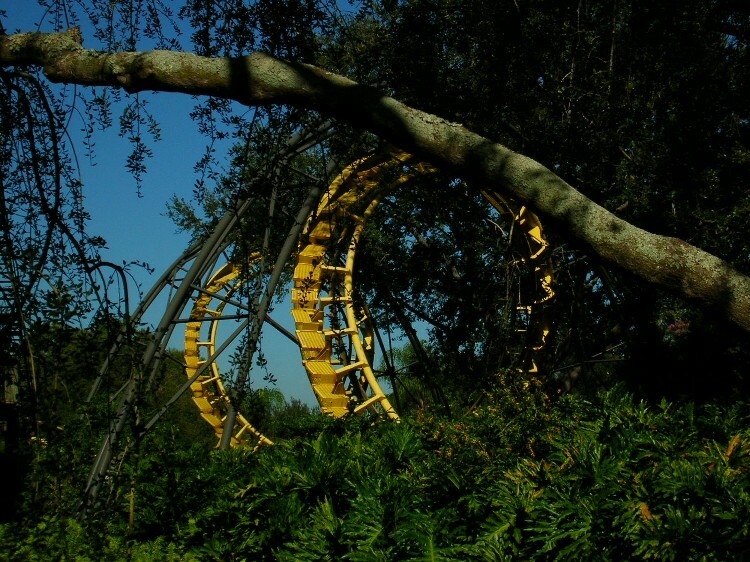 You wouldn't think the coaster was that old by looking at it. They certainly know how to look after their rides there. 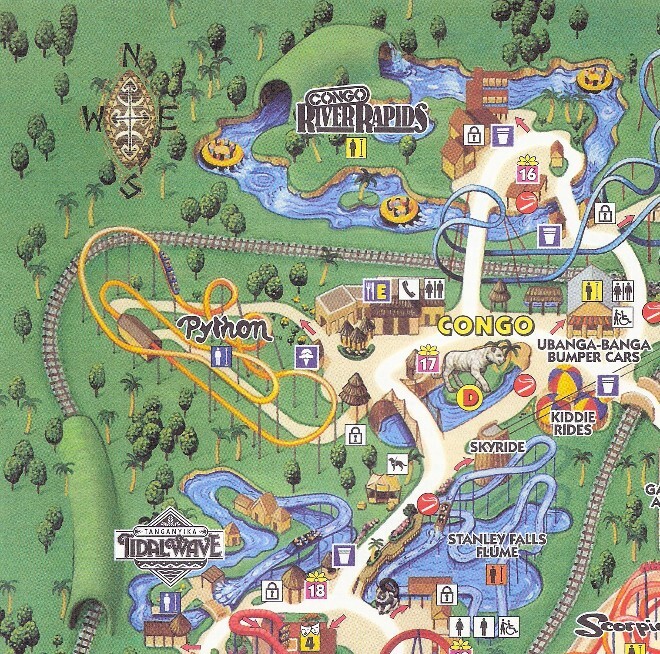 Canobie Corkscrew began operation in Oct - Nov of 1975 as the Chicago Loop at Old Chicago in Bolingbrook Ill. 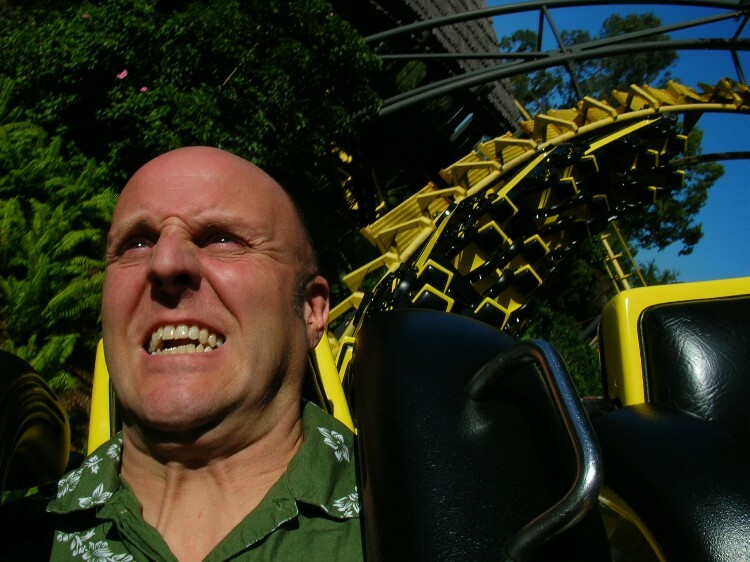 I rode the cork at Myrtle Beach, Cedar Point, BGA and Opryland. None of which I'll cry over. In fact I think CP's is the worst of the bunch and needs to be ripped out now! Thanks for taking the pics, I won't miss the coaster since it was prettier to look at than ride, but still a nice farewell. Great pictures, I know it wasn't a favorite, but its still a little sad to see it go. 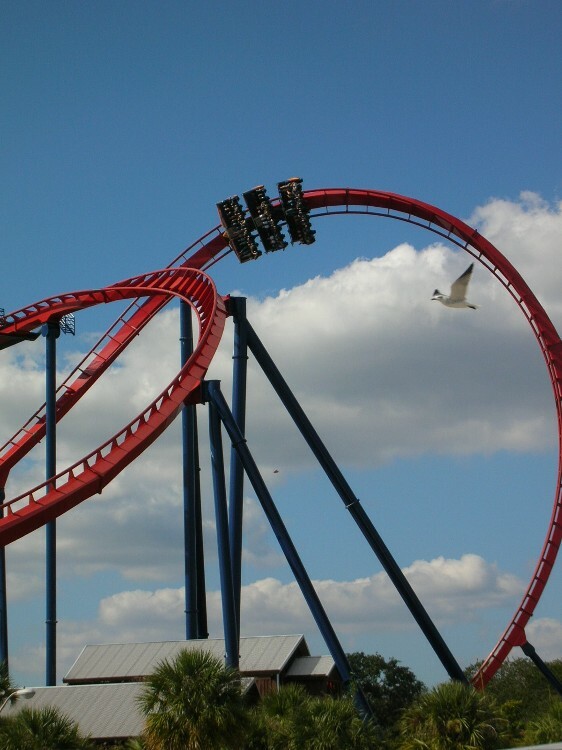 I can totally ride Sheikra. 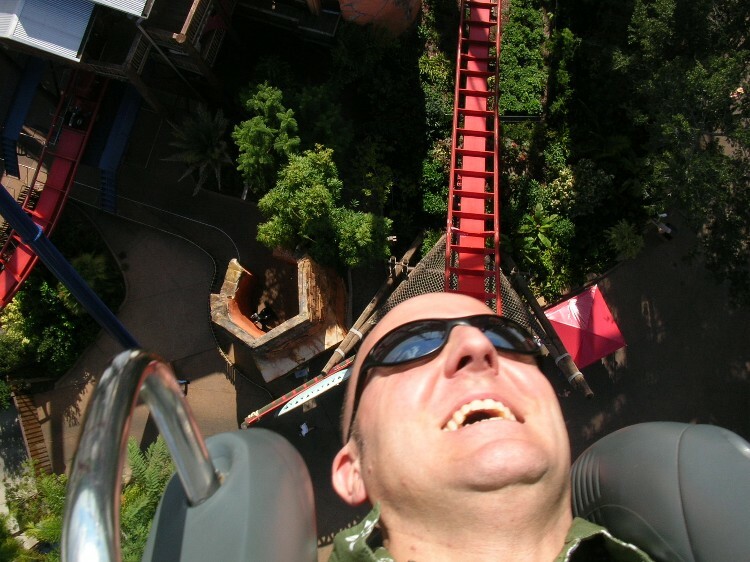 dude, how did your sunglasses stay on on sheikra? 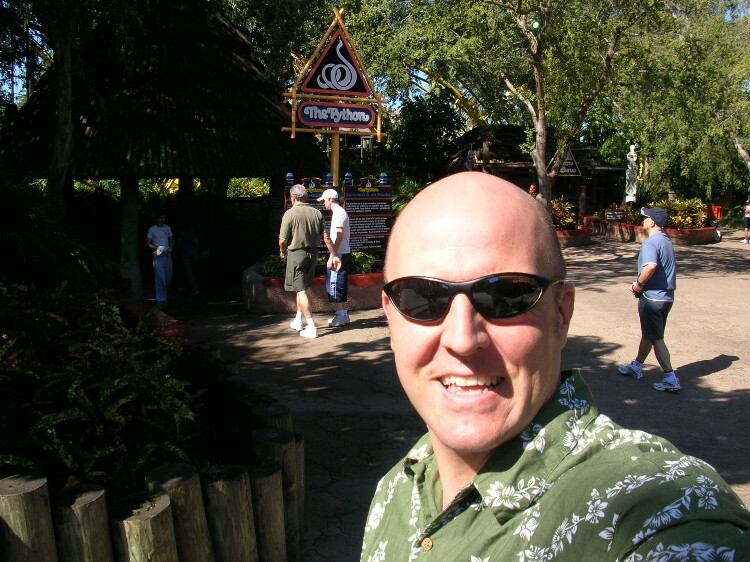 my last pair ended up in the nets at IOA under the hulk!! Ahhh Rust In Pieces Python... can't say i'll miss it to be honest and next time I get there it'll be long gone, as I'm not due a BGT trip till end of next year !! But I certainly have enough chins to ride anything !! You can't help but laugh when they tumble down the stairs ! !